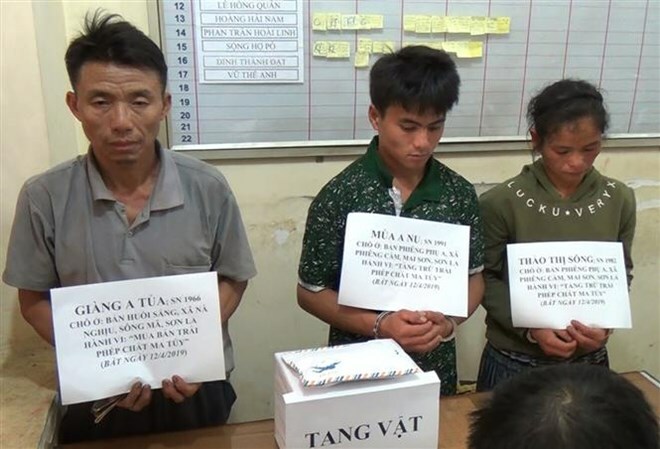 Son La (VNA) – Police in Song Ma district of the northern border province of Son La arrested three drug traffickers and seized more than 7,000 drug pills on April 12. The two among them were Thao Thi Song, born in 1982 and Mua A Nu, born in 1991, both residing in Phieng Phu A hamlet of the province’s Mai Son district. Authorised agencies seized 400 methamphetamine pills and one pack of heroin from the arrested. In further investigation, the police arrested Giang A Tua, born in 1966, living in Huoi Sang hamlet of Song Ma district, for drug trafficking. About 6,800 meth pills, an electronic scale, a sum of money worth 44.5 million VND (1,920 USD) and other relevant exhibits were confiscated. The arrested said they purchased the drugs from a stranger to sell them on. Earlier, Son La police caught a man smuggling a large amount of opium and meth pills. He was Song Po Chua, born in 1992 and residing in Huoi Hin hamlet, Muong Hung commune, Song Ma district.